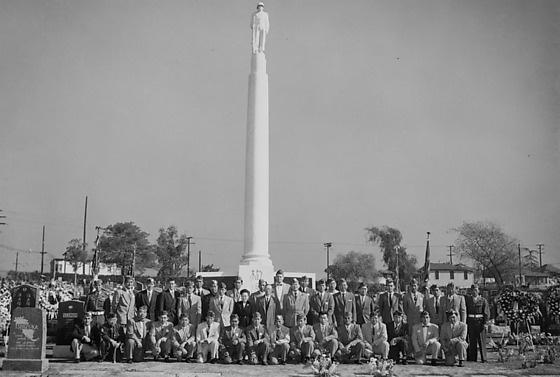 California Nisei Posts of Veterans of Foreign Wars gather in front of World War II monument dominated by a statue of a soldier, Sadao Munemori, standing atop a tall white column for a special service for fallen men of the last war in Evergreen Cemetery in Boyle Heights, Los Angeles, California, February 22, 1953. Includes presentation of wreath and flowers by seven Japanese and Caucasian men, including (left to right) Val Tanaka of Boy Scout Troop 379 (holding bugle), Frank Dobashi of San Francisco, Gordon Winton of the Dept of Service, Reverend Paul Nagano of Japanese Evangelical Missionary Society, Fumio Shiroyama of Hanford, Frank Oshita and Salem Yagawa; and a large group portrait, including Salem Yagawa (kneeling, far left, front), Val Tanaka (second from left, front), Jack Nagano (third from left, back) and Reverend Paul Nagano (fourth from left, back). Tanaka wears a uniform and holds a bugle. Most men wear suits and garrison caps. Wreaths and graves surround monument. Houses, trees and utility poles in background. Typed on original envelope: VFW -- Evergreen.